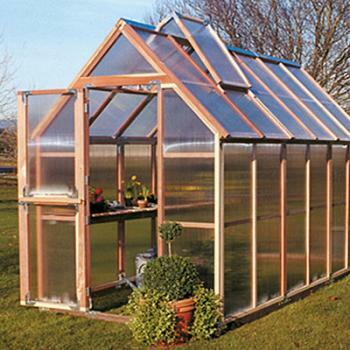 The GardenHouse combines top quality redwood frames, double walled polycarbonate panels, easy assembly, patented rigid tie connectors, a 45 degree roof slope, included solar-powered vent openers, dutch doors and an included foundation system..
America's best greenhouse kit. 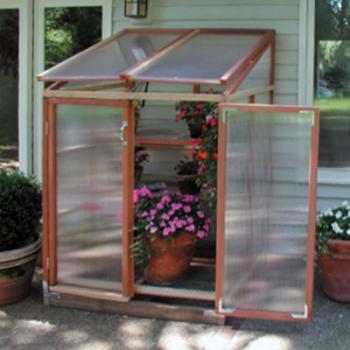 The Sunshine greenhouse was always our favorite store display greenhouse and when it came time for one in our own personal backyard we chose the Sunshine Gardenhouse out of all the many other models we had available. The Sunshine GardenHouse is charming, easy to build and affordable. 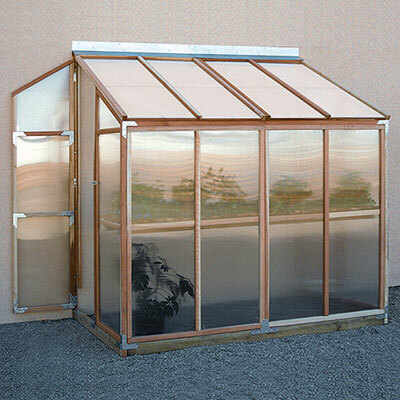 Our greenhouse kits are built strong, made with natural redwood frames and virtually unbreakable double-wall polycarbonate. Whether it be for ornamental flowers or getting an early start with tender plants started from seed. A good greenhouse can help you garden more effectively and share veggies and flowers from your own greenhouse anytime of the year. This site is dedicated to just this quality redwood greenhouse - all orders are placed on our EasyGrow Gardening shopping cart. The largest Sunshine Greenhouse - 8' wide and standing almost 10' tall there is plenty of room for growing (and more). These kit comes in either 8' long, 12' long or 16' long sizes. You can also add 4' long extension kits if you have more room to work with. Mt. Hood kits are 6' wide and 8'4" tall at the peak. Narrow enough to fit in a limited space it comes in 6'x4', 6'x8' and 6'x12' lengths. The lean-to structure is designed to attach to a smooth vertical wall. Exterior dimensions are 4' 3'' wide by 8' long and 7' 3-1/2" high, sloping to 5' 6-1/2". The lean-to has two doors, one at each end. No automatic ventilation is built in. 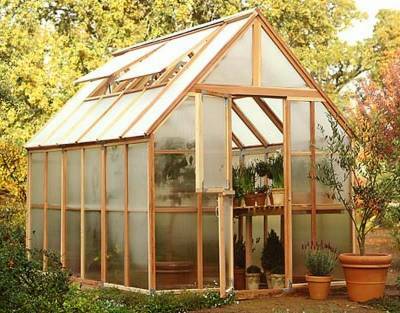 Need more than a cold frame - but don't have room for a greenhouse. This Patio Gardenhouse is great on decks or patios and can easily be moved. 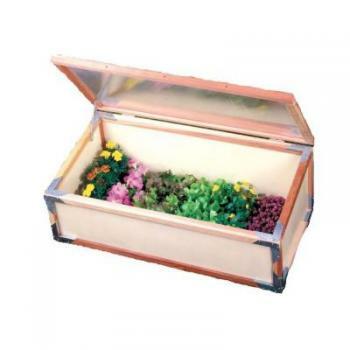 Small and versatile, the Sunshine Cold Frame Greenhouse is rigid and lightweight, making it easy to move to any garden area, from your yard to your deck and even to your table. Mt. Hood and Mt. Rainier benches and shade cloths, anchor kits, grow lights, seedling mats, misting systems and heaters. Redwood frame, dutch doors, quick assembly, temperature control, expandable. Strong connectors, twin wall polycarbonate, natural redwood, built in foundation.